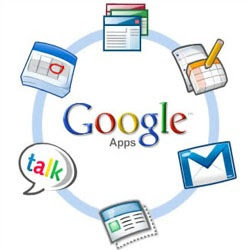 Google Apps is a service from Google for using Google products like mail, docs, calendar etc on your domain name.Google Apps has a free version and you can signup for that and get the Google products at your domain name. You will get a GMail interface for email handling on your domain. You will be able to use this custom email addresse(yourname@yourdomain.com) on Google Talk or any other Jabber Client.If you bought a Custom Domain from Blogger,then you have already created the Google Apps account and so you can ignore this tutorial. 2.When you finish the Signup Process, you will be taken to the Google Apps Dashboard and you will be asked to verify your Domain Ownership. If you are on a Blogger Custom Domain, you will have to create the verification CNAME from your Domain Control Panel. If you have a self hosted website and you opted for the CNAME based Verification, then make a support ticket with your webhost asking them to create the CNAME for you(that is why the file upload method might be easier for you). Once they have created the CNAME(or you uploaded the file as per the instructions), you can verify your domain ownership. Create Accounts for each of your existing @domain email addresses. 4.Now Activate email from your Google APPs Dashboard. Make sure that you have completed Step 3 before doing this. 6.Now you have configured your email. You can now access your email at http://mail.google.com/a/yourdomain.com . If you want to use a custom url, then you will have to create a corresponding CNAME record. For example if you wish to access your mail at mail.yourdomain.com , then you will have to create a CNAME for mail pointing to ghs.google.com . You can Change to a custom url from the Email Settings in Google Apps Dashboard .Similarly you can assign custom urls to the other Google Apps like Sites and Docs after activating them. @Soufiane - yes you can add POP3 email accounts to GMail and it will act like your desktop mail clients which will pull emails from your account at regular intervals. Magnet? it looks like Magnet ? Great tutorial. I have learned a lot from here and I like your screenshots they are cool and nice. Sorry, you've reached a login page for a domain that isn't using Google Apps. Please check the web address and try again." What to do? Will I not able to get this service? i love to read your posts because its to helping me out..
Yippee! your blog is amazing, i don't have to go anywhere else to find solutions for my blog. You've it all right at one place. Thanks a lot. It's so simple yet so useful. Thank you Aneesh for this tutorial. I didn't expect it's so simple really. Keep up the great work! Thank you so much!!! Been a big help. if you decide to buy a custom URL for your blog using google then you automatically get google apps and it's automatically configured! Great all-in-one tutorial. Thank you very much! wow..this is sure.thank u bro.wowwwwwwwwwwwwwwwwwwwwwww. thank u. for this tutorial. I just bought my custom blogger domain -- how do I set up an email with that domain? When I go to the link you said and put in my domain name, they say that that name has already been registered with google apps. Well done mate !!!! very useful artice.. helped me a lot.. God Bless !! !